This article appears in the July/August edition of 11:11 magazine. Modern mankind has inherited a precious many gifts from the ancients. Perhaps chief among these are the rich mythologies that continue to delight our imaginations. Such stories tell of impossible heroes and the fantastic worlds in which they reside. The extraordinary events contained in these texts seem wholly unlike our commonplace everyday lives. Today people do not survive inside of whales, staffs do not turn into serpents, and men do not walk on water. All of this elicits mixed reactions in society. 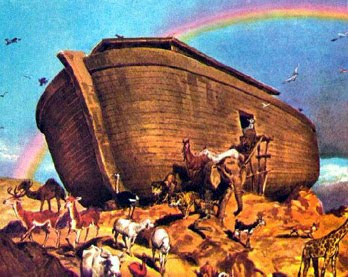 In criticizing the dangers of religion, mythology gets mixed in with dogma and fundamentalism as a social ill. Noah’s Ark is simply one more tool to demonstrate how superstitious minds are undermining scientific progress. Yet, while our media loves a food fight, we should not be hasty to write off mythology or use it as mere fodder for the usual partisan arguments. In fact, myths are perhaps the only tools that can resolve these disputes and deflate the social tensions. They have this unique ability because they bridge the rational and transcendental worlds. We typically approach the world one piece at a time, in a linear fashion. This left-hemisphere brain function helps us deduce based on old patterns, but not form new experiences. Because wisdom comes from firsthand experience, ancient sages shunned traditional teaching methods. They instead painstakingly crafted elaborate verbal paintings to impart their profound knowledge. These paintings are meant to be absorbed whole. For this reason, myths more closely resemble the dreams crafted by our unconscious minds than the linear and clichéd storylines our deductive minds crave. In myths, objects are imbued with deep meaning beyond, and often in spite of, their literal definitions. These odd details challenge us to think on a deeper, symbolic level. As a joke cannot be explained, so too symbolic myths cannot be passively studied. 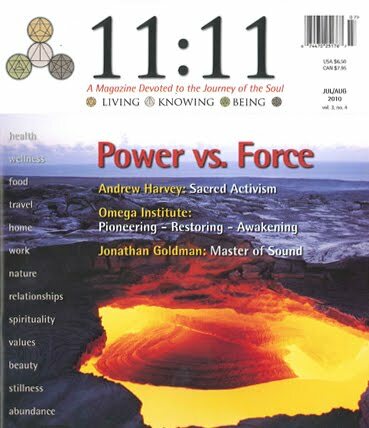 Only after one develops their spiritual intuition and receives certain keys to the symbolism can they fully interpret the story and unlock its inner meaning. For this reason, to read Noah’s Ark as the story of a man and his boat is futile. It attempts to turn poetry into history. Even if one could prove the historicity of a global flood, what does that teach us? The deeper spiritual significance of the tale is far more compelling than any olden event. After all, the progenitor emerging from a great deluge is perhaps the most common of all myths. It finds a shared narrative in the Greek Deucalion, Sumerian Atrahasis, Norse Bergelmir, Chinese Nu-Wah, Aztec Coxcox, Hawaiian Nu’u, Tai Khun Borom, Roman Mannus, Indian Manu, and others with varying degrees of similarity. Whether these stories all refer to a common event or simply draw on archetypal images in the ancient collective unconscious we cannot say yet. However, what is certain is the significance of the message contained therein. Although the ultimate origin of the deluge myth remains unknown, linguistics and other sciences can establish relationships between particular stories. For example, the Hebrew story of Noah is quite likely a derivative of an older Indian myth of Manu. A comparative reading of the two stories reveals some important similarities and differences. We hear of Noah’s story from the sixth to ninth chapters of Genesis, the first book of the Jewish and Christian bible. The story of Manu is similar, but has certain key differences that allow us to glimpse into a deeper meaning behind the symbolism. As told in the Mahabharata, Vaivasvata Manu too was a righteous human being and great king. While performing ablutions in a pond, he raised a handful of water to the sky in offering. In his hands, he found a small minnow named Matsya. The fish pleaded for protection from the bigger fish in the pond. Feeling compassionate for little Matsya, Manu put it in his water pot before leaving. As the days progressed, the fish grew larger and larger. It first outgrew his water pot, then a tank, then a well, then a pond, then the Ganga river, and so on. When this little fish had grown too large for even the Indian Ocean, Manu was completely awed. “Who are you? 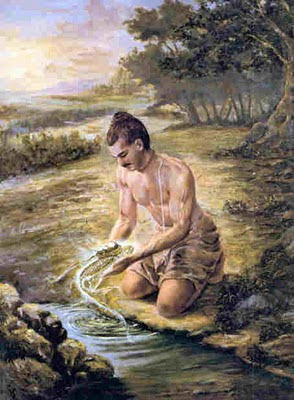 I have never seen or heard of such wonders…” He continued contemplating the fish’s true identity until he realized that he was dealing with Vishnu incarnate. The disguised deity then appeared and informed Manu that a flood would soon bring about the end of the age. Manu must build a boat to protect the living beings and sacred knowledge. After some time began years of terrible drought, famine, and starvation. The sun blazed in fury and burnt the earth, dark clouds formed, and water engulfed the earth. Manu entered into the boat with the seeds of plants and animals along with seven great sages as ordered. He then yoked the boat to the horn of the giant Matsya fish. Being thus tethered, Vishnu’s incarnation guided the ark along and answered several of Manu’s questions as he was being lead to safety. Before reading on, take some time and meditate on the two stories – their similarities and differences. Try to sculpt a meaning around these seemingly odd narratives. It is a daunting but worthwhile challenge. There are several linguistic and symbolic keys that help us unlock this beautiful narrative. The name Manu is derived from the Sanskrit word “manas” or mind – in fact, our English word “man” also originates from this word. Given this detail, we find ourselves faced not with the historical story of a single man, but with a teaching about the human mind. Next, we turn to the fish. That the fish is a ubiquitous symbol for deity is well understood; Jesus, Bacchus, Dagon, Oannes, Vishnu, and many other deities find symbolic representation as fish. Thus, the story of a man and a fish becomes that of a mind and the divine soul. With these two keys alone, we can begin to unravel the deeper meaning of the narrative. When the mind is engaged in prayer, in the great pond of thought, it finds a helpless minnow. In our minds, the thought of divinity is but a small fish compared to the bigger thoughts of desire. If the mind is both wise and compassionate, however, this budding spirituality can be sheltered and protected. Like the mustard seed, the small minnow of divine consciousness begins tiny but soon grows stronger and more powerful. All it needs is a nurturing environment. With great ease and quickness, the soul’s power increases. Soon its strength exceeds even the wildest imagination of the mind that lovingly protected it and watched it grow. As is said widely in India, “One who shelters goodness is then sheltered by goodness.” In a role reversal, the newfound spirituality now becomes the protector. In this capacity, it reminds the mind of an important fact: the world will soon end in a great flood. The flood is not a global destruction in the objective sense, but a global destruction in the subjective sense. The flood is death. One of the crucial downfalls of the mind is its inability to fathom its own impermanence. 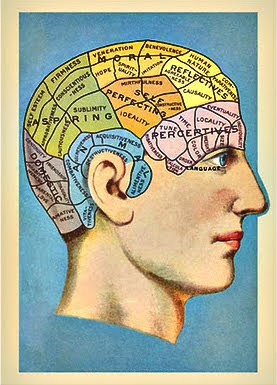 Most of our thought is directed towards immediate pleasure, and occasionally to longer-term considerations. Rarely does one contemplate one’s own mortality and make serious effort to merit a glorious afterlife. However, when the soul gains ascendancy over the mind, this goal becomes quite important. Only then does the mind realize it needs to build an ark. The ark is not a literal boat made of wood, but instead a vehicle that will carry the mind into death. It is built of our life’s work, our karma. The actions and intentions of our entire life form the structure of this vehicle, which some cultures call an astral body. So through our labor in this world, we become prepared for our journey into the unknown. Each deed that we perform and each thought that we have changes the constitution of our ark; building only stops once we stop. Yet, as we age, construction gradually diminishes as our days draw to a close. The overbearing heat, drought, and famine described in the story symbolically remind us of the infirmities of old age; hinting that soon the hourglass will run out of sand. In the adversity of one’s advanced years, perhaps the greatest solace of a life well-lived lies in hope of the future. There is great strength in knowledge that our ark is nearly finished and soon the spirit will arrive to protect and care for us. And quickly enough, the great flood of death is upon us. As the physical body begins to perish, the mind enters into the astral body. Yet, reaching this plane requires a navigator. At this point in the death process, the soul appears in full glory to guide the mind. Thus the ark is yoked to great Matsya. Here is, perhaps, one of the most illuminating keys to the entire myth. The word “yoke” is a literal translation of the Sanskrit term “yoga.” As a human dies, there is a yogic method that enables one to yoke themselves to their soul and retain consciousness through the process of death and the worlds thereafter. The particulars of this knowledge are not fit to be printed here, but have been explained elsewhere by great yogis. When yoked to the immutable soul, the mind is guided through death, where many secrets of the universe are revealed. When the journey is over, one is reborn into a new world, ready to begin their next life. Depending on the quality of the ark and the strength of its tether to truth, one may be reborn into a celestial world to enjoy the fruits of labor before returning to the earthly realm, or perhaps even to the ultimate liberation of full union with divinity, the fountainhead of life itself. Yet, instead of getting lost in metaphysical speculation about what happens next, this story ends and brings us back to the present moment. Right here and now, we are building our ark. What kind of ark are you building? Have you nurtured the seeds of compassion and toiled hard in the quarry of life? Do you have a contemplative or meditative process that allows the little fish of your own divinity to survive in the chaotic pond of your own mind? From this story we learn that the particulars of our religion, rituals, or rites do not have enduring value. It is instead the actions and intentions of this life that truly affect our next. So then the story of Noah and Manu is not about some ancient historical world. It is about our very life, right here and now. Whether there ever was a Manu, we cannot say. Yet, none can deny that the manas, or mind, is alive today. The story is not as much about the afterlife as it is about living a good life here and now. It reminds us constantly, like the little minnow, to “build your ark, build your ark, for the flood is coming soon!” Yet, despite the profundity of this message, the ancients were seldom content to imbue a myth with but a single meaning.